Mogán is a town and a Spanish municipality in the southwestern part of the island of Gran Canaria, which is one of the three main islands making up the Province of Las Palmas in the Canary Islands, Spain. Its population is 21,782 (2013), and the area is 172.44 km². Mogán is the second largest municipality by area on the island. It includes the fishing towns of Puerto de Mogán and Arguineguín. Much of the population lives on the Atlantic coastline. The town of Mogán is about 8 kilometres from the coast, 11 km north of Puerto Rico de Gran Canaria and 40 km south-west of Las Palmas. The GC-1 motorway passes through the south of the municipality. There is a string of tourist resorts along the coast. Puerto de Mogan, a resort and fishing village. The valley of the Sea (cañada de la Mar) was also declared Property of cultural interest as archaeological zone, in 2005. Veneguera's "Cogolla" (La Cogolla de Veneguera) is in the upper part of the Veneguera ravine in the north-west of the municipality. Mogan's windmill ("molino quemado de Mogán" is listed since 2002 as Heritage site in the category "ethnological site". ^ This uTube video shows the Mogan's ravine (1'02 - 1'11) where the Cat's' ravine archaeological site is located. 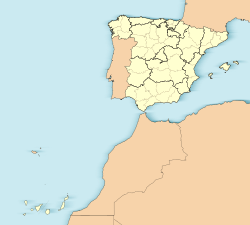 ^ List of archaeological sites in Mogan municipality, on grancanariapatrimonio.com. See also Mogan on estodotuyo.com. ^ Lomo Los Gatos on grancanariapatrimonio.com. ^ (in Spanish) "Decree 259/1993, September 24, 1993, by which the Cats' ravine ("Lomo de los Gatos" is declared Bien de Interés Cultural, in the category of archaeological zone. BOC N° 137". 27 October 1993. p. 1735. .
^ (in Spanish) "Decree 175/2005, July 20, 2005, by which "La Cañada de La Mar" is declared Bien de Interés Cultural, in the category of archaeological zone. BOC No. 149". 1 August 2005. p. 14376. .
^ La Cogolla de Veneguera on grancanariapatrimonio.com. 27°51′12″N 15°46′23″E﻿ / ﻿27.853309°N 15.773°E﻿ / 27.853309; 15.773. ^ (in Spanish) "Decree 39/2006, May 9, 2006, by which "La Cogolla de Veneguera" is declared Bien de Interés Cultural, in the category of archaeological zone. BOC N° 093". 16 May 2006. .
^ (in Spanish) "Decree 39/2006, May 9, 2006, by which "La Cogolla de Veneguera" is declared Bien de Interés Cultural, in the category of archaeological zone. BOC N°" (PDF). 28 October 2002. p. 17795. . This page was last edited on 2 February 2019, at 11:15 (UTC).